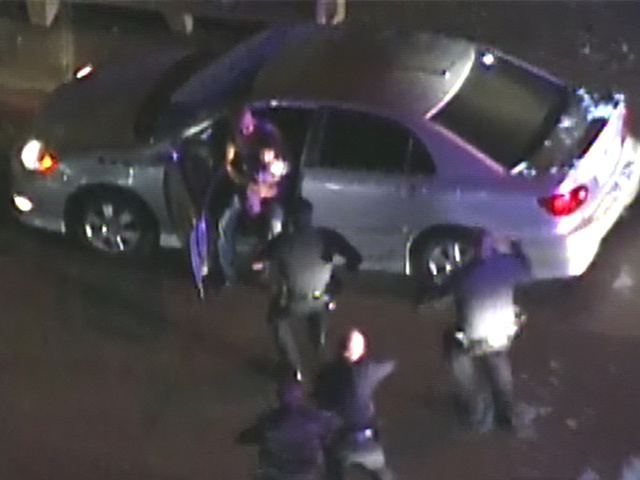 LOS ANGELES -- A police pursuit of a man with a young child in the car has ended in the Silver Lake area of Los Angeles with the man in custody and the child safe. CBS station KCAL-TV says the pursuit began in the Atwater Village area Monday night when the mother of a 4-year-old girl called police with a report of a possible kidnapping. KCAL says the man is the girl's father. Video footage on KCAL showed the driver slowing, then coming to a stop in Silver Lake. He opened the car door with the child in his lap. After repeated commands by officers to surrender, the man stood up with the child in his arms. Police then swarmed the man, safely grabbed the child and took the man into custody.